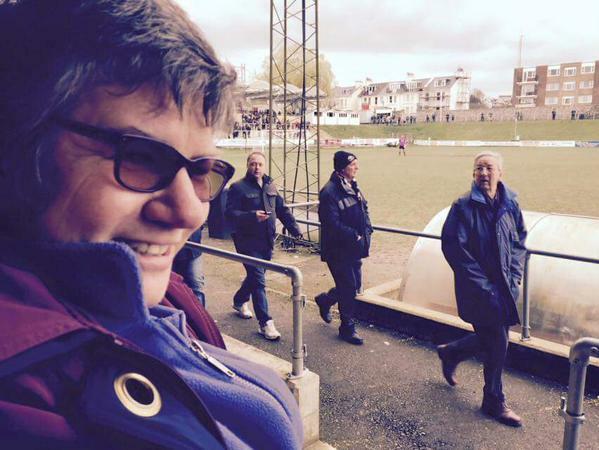 Lewes aren’t alone in sitting on the doorstep of a much bigger club. However, we are relatively unique in the fact that we pre-existed in our current home for over 125 years before Brighton & Hove Albion moved 5 miles down the road into the impressive American Express Community Stadium at Falmer. Northern Premier League One side Droylsden FC may also fit into this bracket, having played at the Butchers Arms ground since 1892 and around 110 years before Manchester City were parachuted into their stadium, built for the 2006 Commonwealth Games around 2.5 miles down the Ashton New Road. Before I start, let me first say that nobody begrudges the Seagulls their stadium or the success they have experienced since moving from the basic surrounds of the Withdean. As a club we have a great working relationship with The Albion and long may it continue. My weekly drive down to the Dripping Pan includes that magical moment when you round the bend on the A27 at Stanmer and the stadium looms into view. Apart from a dozen or so Premier League clubs, who wouldn’t want to call the stadium at Falmer their home? I could wax lyrical about the small touches that mean from a Fan Experience view it rates up there with the best. Heck, 24 hours previous to our game today I was actually sitting in the North Stand myself with a chicken and ham pie watching the Seagulls take on Norwich City. My tale today relates of the pains in trying to appease everyone whilst pleasing no one. Brighton & Hove Albion welcomed Blackpool to the Amex, whilst Maidstone United were visitors at The Dripping Pan. 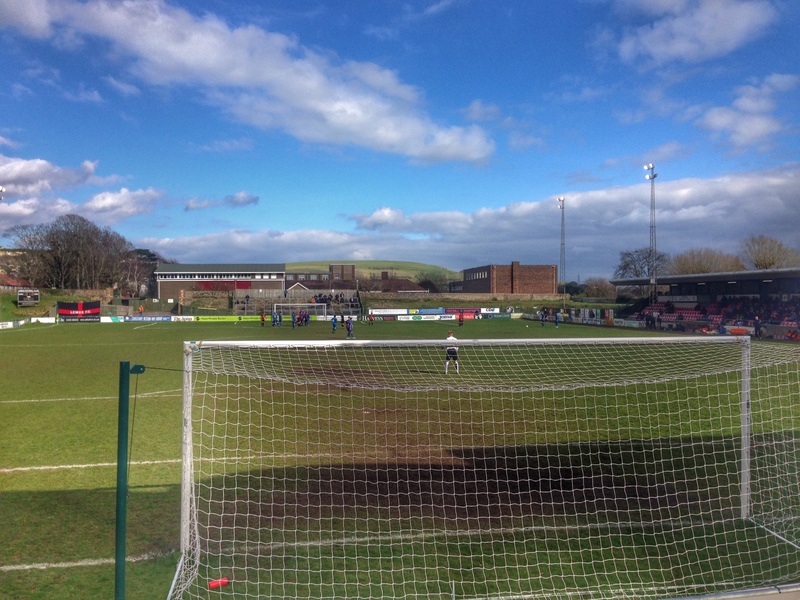 Arguably this would be Lewes’s biggest away crowd of the season as The Stones travel in big numbers and it being one of their more local games (just a 38 mile trip) on a nice day we welcomed around 150 fans in a crowd of 621. Lewes’ previous Saturday game against Wingate & Finchley (away fans 30) had been 683 on Non-League Day, so all things being equal I would have expected a crowd in normal circumstances of around 700. 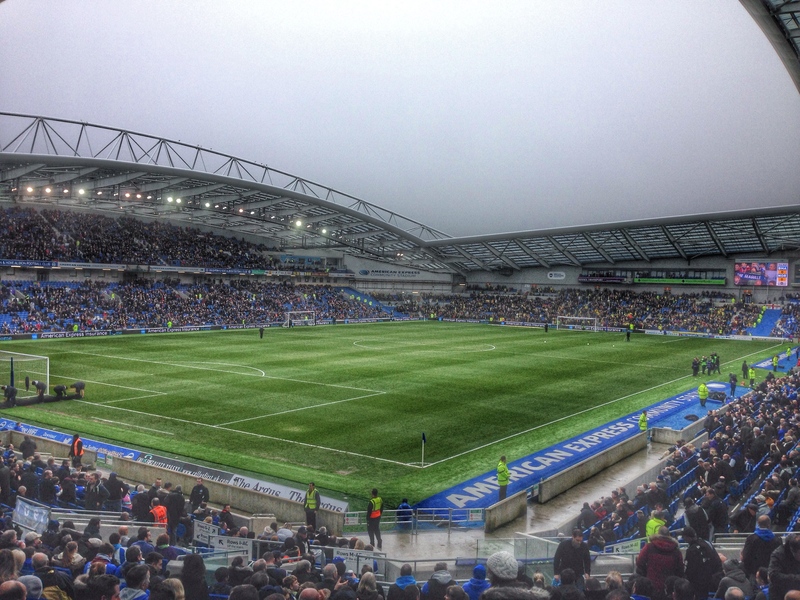 However, the gate at the Amex was 24,579, down by over 1,200 on their first three games of the season, although you do need to factor in a relatively small traveling support from Lancashire. The winners here? Brighton & Hove Albion. Without a league win for almost two months and facing a Metropolitan Police side who brought 1 fan (that we could see) there wasn’t much surprise to see the attendance for this one to be as low as 426. However, just down the road Brighton welcomed Rotherham United and the 24,370 was the lowest attendance they had had for a Saturday game so far in the season. New manager honeymoon period wearing off, or simply another low turn out from the away fans? The winners here? Lewes by a hair’s breadth. But what if I now throw in that the Lewes game kicked off at 12.30pm? 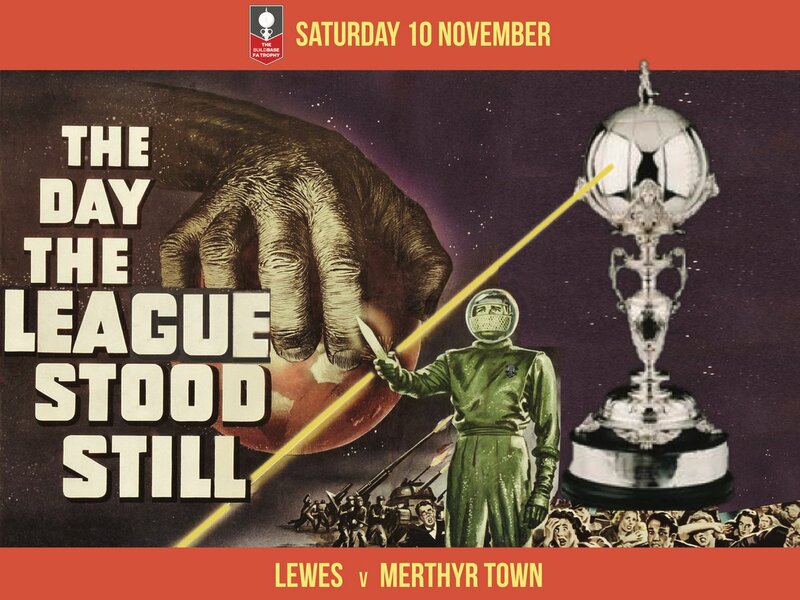 That surely was the compelling event that saw the respectable Lewes attendance? Lewes, injury and suspension hit, in the middle of another sag in form, welcomed Hendon on a cold February day. Whilst the visitors were steaming up the league, they have not been able to boast significant traveling support for a number of seasons. Even so, a crowd of just 364 saw a barn-storming game of sending offs and outfield players going in goal. Down the road, The Seagulls hosted Nottingham Forest with over 26,000 watching the game. Hard to argue with those stands and the obvious winner was Brighton. Of course in all of these instances, the amount of revenue we saw on match day may not be proportional. For instance, we had very high bar takings for the game versus Maidstone United simply because the proportion of adults in the crowd of 621 was more than in the game against Met Police because visiting fans do not tend to bring many Under16’s, who spend less on alcohol (we hope). 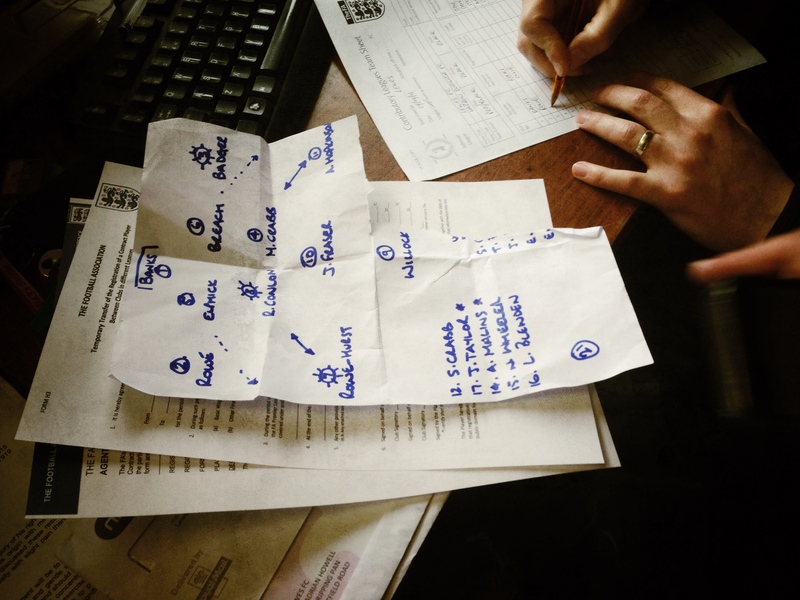 Our issue of whether to move a game or not if there is a clash is a difficult one. In some ways we are damned if we do, and damned if we don’t. If we would have moved the games against Maidstone United or Hendon, would we have got more fans? That will depend on when the game was played. A Friday night match experiment has been talked out and that may have worked for Maidstone, with relative short distances to travel, whilst an early kick off such as the game against Met Police does seem to have a more positive outcome. Over the past few seasons where we have gone head to head there is a noticeable reduction in our gate, so we would be mad not to at least try to move a game. It isn’t an easy decision to make – not only do we have to weigh up the mood of our fans but also have to approach the Ryman League and our opponents. Most will be more accommodating for a change to an earlier Saturday kick off, few like the idea of a Friday night or Sunday game though for obvious traveling reasons. One of the hottest topics on the forum this season was around the shifting of our Christmas game against Bognor Regis Town. Originally schemed for Boxing Day, the game would have clashed with Brighton’s game with Reading. Despite the lack of public transport on the day, we felt that our gate would suffer with fans who come out in force for their Christmas jolly having to decide one or the other. Interestingly enough, we weren’t the only Ryman Premier League club who had the same thoughts, with eight of the twelve scheduled games eventually being moved from Boxing Day. Our reasons for moving? Sure, the fact that Brighton were at home was at the forefront of our thinking as well as the opinions of our fans although like most clubs, there is only a very small minority who ever make themselves heard (whether it is a pro or against a fixture change), but so was the fact the 27th was actually a Saturday, and by moving it back to then, we were still retaining the traditional 3pm Saturday kick-off. Bognor, and their fans, were more than happy with the move as it meant that they could use public transport. Consequently the 1,007 crowd is still the best at the Dripping Pan this season, and interestingly 14% up on the corresponding fixture played on Boxing Day in 2012. Fortunately, the Championship decided to schedule their Easter games on Good Friday meaning that we had no difficult decisions to make with regard to our six-pointer against Harrow Borough. The visitors were dead and buried a month ago but then the players appear to have seen the flight and arrived in Lewes on the back of a seven game unbeaten run that has yielded fifteen points, ten of which have been against other relegation-threatened teams and consequently lifted them out of the bottom four for the first time since Christmas. This sounds a little like deja-vous but a win would see the Rooks as good as safe, whilst defeat would really see the nerves creep in with just three weeks to go until the end of the season. The good news – 70% of our points had come from our home games this season. The bad news, we had taken less than a point on average from the games we played against the teams in the bottom ten. Let’s just focus on the good news, shall we? At 4:43pm Lewes were in 15th position. Essentially the league at the moment is divided into 5 clear section. The top 3 (with 3 teams competing for top spot, obviously), the Play-off contenders (the next 9 clubs), No-man’s land (Basically Leatherhead and Billericay Town who can’t go up or down), Bury Town (relegated already) and a ten team battleground to avoid the three other relegation spaces. 15th represented being “top of the league” in that last section. At 4:47pm we had dropped two places, but more importantly conceded defeat to Harrow Borough, one of our rivals. 92 minutes were on the clock when Lewis Driver tapped home unmarked at the far post to give Harrow the win. Was it fair? Was it unjust? Can we blame the referee for not giving a free kick or adding on too much time? Absolutely not. 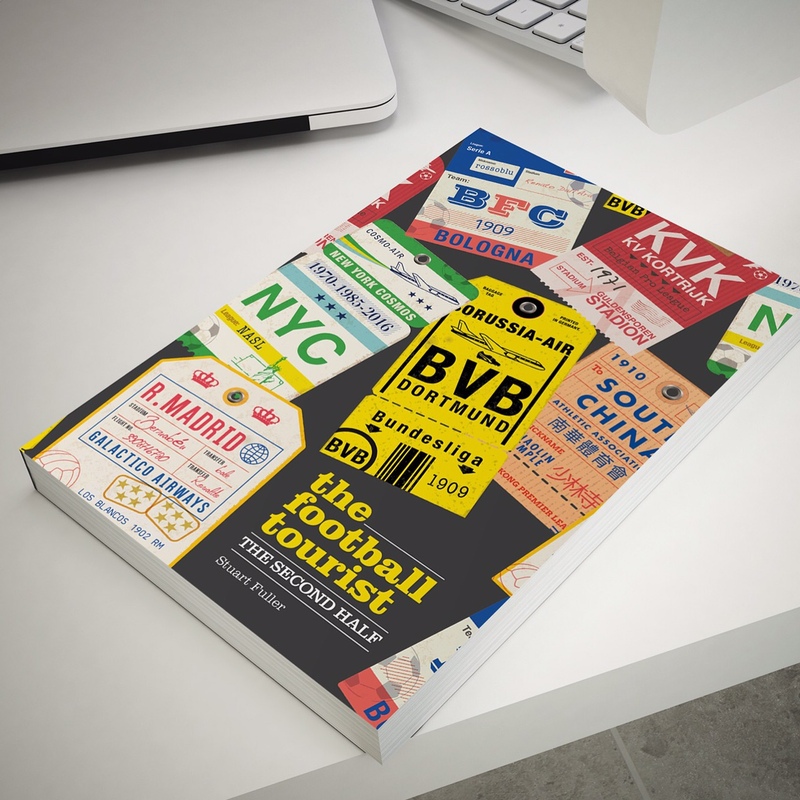 Football is an unpredictable game – that’s its beauty. 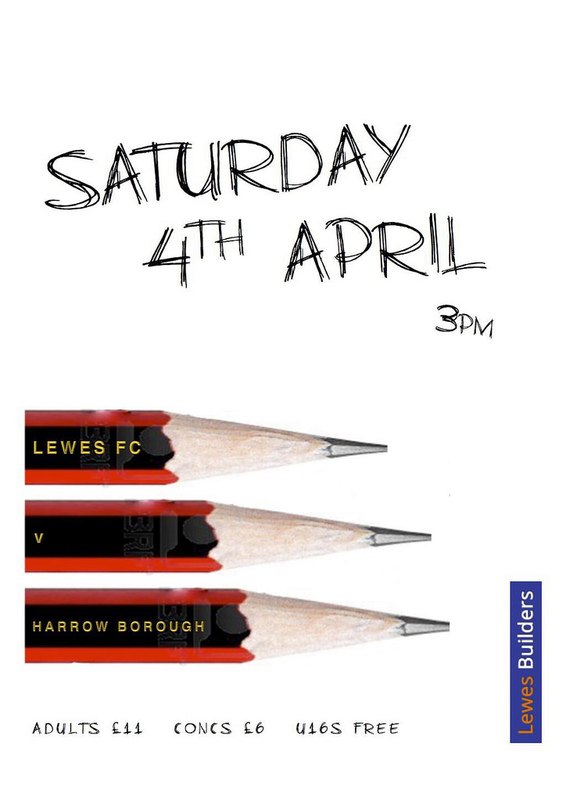 Harrow weathered the Lewes storm (well, a mild gust to be honest as we rarely tested the Harrow keeper) and scored after not one, but two Lewes players slipped in possession. The referee? Didn’t put a foot wrong in my opinion all afternoon – nice to see one who seemed to enjoy letting the players take centre stage rather than his decisions. Obviously at the final whistle, Harrow celebrated like Prince told us to 33 years ago, whilst the Lewes players looked like they had been listening to too much Radiohead. It was fair to say that the dressing room wasn’t a lively and bubbly place to be post match. However, other results didn’t cause us too much damage and there is the opportunity on Monday to get that vital win when the Rooks travel to Bognor Regis Town. The crowd? 643 since your asking with a dozen or so Norwich City fans taking the opportunity to take in a second game in twenty-four hours, probably double what we could have expected if Brighton had decided to play at 3pm on a Saturday rather than Friday. Everyone’s a winner. This entry was posted in Lewes FC, Non league football, Rymans Premier and tagged Brighton and Hove Albion, Harrow Borough, Non League, Ryman Premier League. Bookmark the permalink. Is that all you have at home?